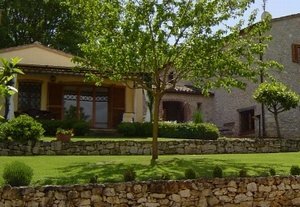 Amelia Umbrie Guesthouse 2-4P Il Gelso is a beautiful restored farmhouse that features a lovely self-sufficient guesthouse located in the rolling hills in the south of Umbria. The guesthouse is approx. 50 square meters and is perfect for a couple, however a family of four can be accommodated by a double bed-sofa. It is fully equipped with charming furniture. Property is completely enclosed with a scenically positioned 5x10m swimming pool set on a paved terrace with outdoor shower and a loggia for shade and loungers for admiring fantastic views of rolling hills and beautiful countryside. Mountain bikes and walking paths through the surrounding woods for a perfect relaxing vacation. Very helpful and english-speaking owner who lives in a separate house on the property. The guesthouse is situated on the ground floor, one double bedded room, bathroom with bath, guest WC, fully-equiped kitchen (dishwasher, washing machine, microwave, filter coffee machine, espresso machine, bread machine) , dining-living room (air-conditionined), Sat TV, portable CD/cassette player) with large doors to outside, terrace with barbecue and dining table for sunny lunches and starlit dinners. Excursions to Amelia, Secret Gardens of Bomarzo 10min, Roman ruins at Carsulae, Todi and Orvieto 30min, Rome, Spoleto Perugia and Assisi in less than 1 hour. Railway station for Florence and Rome and motorway exit at Attigliano 10min, Rome Fiumicino airport 1 hour 30min. Final cleaning: €50 Amenities: WiFi Internet, breakfast service and maid service, baby-sitter service on request. Minimum rental: 3 days (July and August high season minimum 1 week). The guesthouse is situated on the ground floor, one double bedded room, bathroom with bath, guest WC, fully-equiped kitchen (dishwasher, washing machine, microwave, filter coffee machine, espresso machine, bread machine), dining-living room (air-conditing).